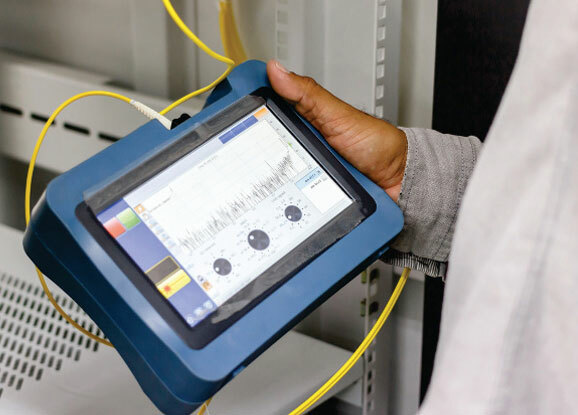 This is carried out on the PON networks (Point to Point) and FTTH networks (Fibre to the Home) – Optical Time Domain Reflectometer (OTDR) is useful for testing the integrity of fibre optic cables. It can verify splice loss, measure length and find faults. An OTDR test allows discovery of issues along the length of a channel that may affect long term reliability. Insertion Loss Measurement testing is a measurement of the loss, or attenuation, of a fibre optic cable component or system. This is normally measured with a light source and an optical power meter, or alternatively a loss test set that incorporates both a light source and power meter. ORL testing measures the back reflection of connectors and components in high-speed digital and analogue system applications. Intelligent Optical Link Mapper is an innovative OTDR-based application that uses multi-pulse acquisitions and advanced algorithms to deliver detailed information on every element on the link. Polarization Mode Dispersion is a form of testing to check the capacity of the fibre cable showing the integrity of the network. (PMD) testing is becoming essential in the fiber characterization process, but still one of the most difficult parameter to test, due to its sensitivity to a number of environmental constraints. Chromatic Dispersion is a term used to describe the spreading of a light pulse as it travels down a fibre when light pulses launched close together (high data rates) spread too much and result in errors and a loss of information.